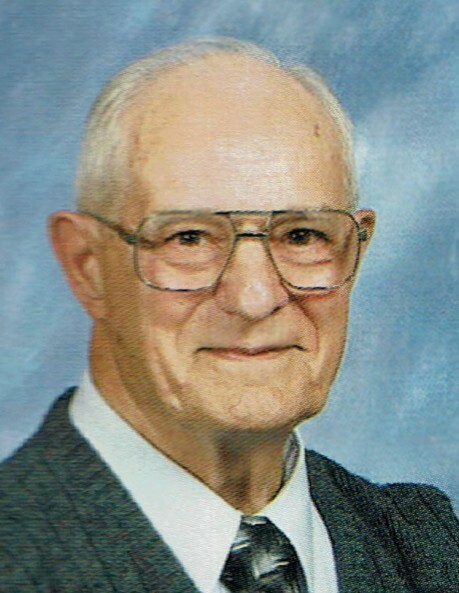 Harvey Deschene, 94, formerly of Argyle, MN, died on Tuesday, May 8, 2018, in Lutheran Sunset Home, Grafton, ND. Harvey Aime Deschene was born on September 30, 1923, in Argyle, the son of Alphonse and Anna (Rochefort). He attended Argyle public school before enlisting in the US Army in 1945, serving in Hawaii and Japan. He was honorably discharged in November of 1946, and Harvey returned home to the family farm. On November 8, 1954, Harvey was united in marriage to Rita Rivard, in Alberta, Canada. The couple raised five children and Harvey worked for Argyle Public Schools as a janitor and bus driver for 32 years. He was active in his community, serving on the board and as a treasurer for the Middle River Township Board, as well as being the Commander of the local American Legion for a number of years. Whatever his achievements, Harvey's faith was the most important thing to him. As a lifelong member of St. Rose Catholic Church, Harvey was privileged to serve as a greeter, an Extraordinary Minister of the Eucharist, and on the St. Rose Cemetery Board. Harvey is survived by his children, Norman (Barbara) of Bismarck, ND, Theresa (Ralph) Lambert of Paynesville, MN, Phillip (Pamela) of Toledo, WA, Connie (Robert) Price of Stephen, MN, and DeeAnne (Tim) Johnsrude of Bremerton, WA; seven grandchildren; and eleven great-grandchildren. In addition to his wife, Rita, who passed away on December 13, 2002; Harvey was preceded in death by his parents and all of his thirteen siblings, Leo (Clara), Clarence (Eileen), Clarice (Homer) Asslien, Ole (Beatrice), Edward, Leah (Edward) Pagnac, Omer (Hellen), Pauline (August) Pagnac, Josephine Deschene, Mary (Raymond) Pagnac, Ernest (Freda), Charles (Mary), and Louella (Bernard) Kerrigan. MASS OF CHRISTIAN BURIAL: Saturday, May 12, 2018, at 10:30 AM, in St. Rose of Lima Catholic Church, Argyle, MN. VISITATION: Friday, May 11, from 5-7:00 PM, in St. Rose Catholic Church. ROSARY: Friday night at 7:00 PM. INTERMENT: St. Rose Catholic Cemetery, Argyle.